Bibliographers have done much important work on the history of the novel in the long eighteenth century. Scholars are indebted to bibliographies from McBurney’s Check List of English Prose Fiction, 1700-1739 to Beasley’s Novels of the 1740s to Raven’s British Fiction, 1750-1770 and Garside et al.’s The English Novel, 1770-1829; these works form the foundation of a great deal of scholarship. But there are some things that bibliographies cannot do. When I set out to plan a book chapter on fiction in the years 1660-1700, I found very little that could serve as a guide to help me identify which texts would be most useful and important to read. 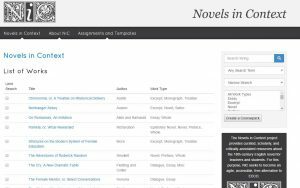 The Early Novels Database was promising, but was not then available, and in any case was focused on texts held in one particular library. So I began compiling what was at first a simple list of titles drawn from older bibliographies and gradually became a spreadsheet and then a database. As I worked on the initial list, it became clear that in order to decide what to read, I needed to know more about each text’s material and paratextual features: which texts, for instance, were fully epistolary, and which included letters in the fiction? Which texts had addresses to the reader, and which had dedications? And of course, as I began consulting EEBO scans to identify these features, other features also struck me as worthy of note: indexes, chapters, tables of contents, and so on. And as I gathered this information, it occurred to me that other scholars might be interested in a resource like this. Thus was born the Restoration Printed Fiction database, now available online. 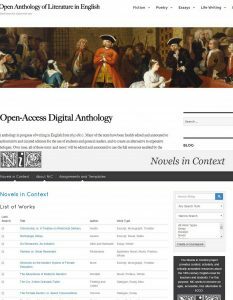 It catalogs metadata for the 394 works of fiction published between 1660 and 1700. To generate this list of fiction, entries were drawn from three main bibliographic sources (with some additions): Paul Salzman’s English Prose Fiction 1558-1700, Robert Letellier’s The English Novel, 1660-1700, and Robert Adams Day’s Told in Letters. For the purposes of the database, fiction was defined very broadly; given the novel genre’s emergent status at the time, it makes little sense to apply any kind of strict definition that would not have operated for contemporary readers. If one of the bibliographies (or another scholarly source) treated it as fiction, it was included in the database. This broad approach makes it possible for scholars to cast a wide net when considering the nature of fiction. Also, I’ve only included the first printing in this period of a given text: If a text was first published before 1660, I included the first edition that was published after 1660; for texts first published after 1660, only the first edition is listed. In a later phase of the project, it may be possible to include subsequent editions, which would be helpful in gauging the popularity of texts. Each entry includes basic bibliographical information about the text, such as author (when known), title, bookseller and printer (when known), and date. This kind of metadata allows users to search for particular booksellers or even particular printers, thus making it possible to begin to answer questions such as whether any booksellers may have begun to specialize in fiction in this period, or whether it was more common for a bookseller to publish only one or two works of fiction. How significant is it, for example, that Samuel Briscoe appears as bookseller on fourteen title pages? Do the fifty-four texts not listing a bookseller have anything in common? Other kinds of metadata, of course, make possible other kinds of research questions. The RPF database also includes metadata about several kinds of paratexts, such as dedications, prefaces, addresses to the reader, and prefatory poems. This metadata becomes especially interesting when we search for texts that have more than one of these paratexts. Are dedications more common in conjunction with prefatory poems, for instance, than with other paratexts? Interestingly, of these 394 fictions, sixteen have three paratexts, but none have all four types — and 120 have no paratexts at all. Other researchers might be interested in fictions that are divided into chapters, or fictions that appear with a licensing statement, or fictions that give errata; all of these things are discoverable in the RPF. A crucial part of the process of producing the RPF was finding a way to make it available to others. Dr. Michael Faris, my colleague at Texas Tech, and then Director of the English Department’s Media Lab, made this possible. Dr. Faris did the coding that makes the searchable database available to others, a process which entailed meeting to understand the content and aims of the database, teaching me how to generate something he could then use as a basis to work with, and writing the code that allows the resource to be useful to scholars. 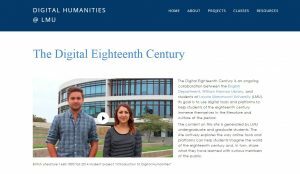 Such collaborative work is especially important in digital humanities work because bringing different skill sets together enables new kinds of work and new kinds of resources that, we hope, will continue to generate new scholarly questions and work. What do Red Jacket, Pompey Fleet, James Macpherson, Mary Washington, and Geoffrey Chaucer have in common? 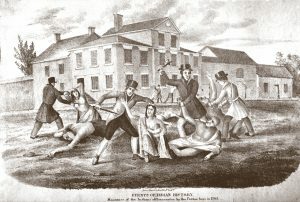 They all are depicted in, influences for, or creators of the 300 broadside ballads Isaiah Thomas (1749-1831) collected from Boston printer Nathaniel Coverly in 1814. Mostly printed in Coverly’s shop between 1812 and 1814, these ballads offer a window into street life in the early United States, with an eye toward the future but with a preoccupation with the past. Thomas coined the phrase “verses in vogue with the vulgar” to describe this collection that he had bound in three volumes and that are some of the American Antiquarian Society’s earliest holdings. With over 800 images and 300 mini-essays, Isaiah Thomas Broadside Ballads Project: Verses in Vogue with the Vulgar offers a unique and comprehensive view of the broadsides that Isaiah Thomas collected. Each broadside includes a brief explanation of its content by Kate Van Winkle Keller. 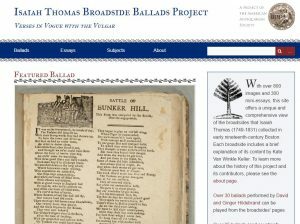 The Isaiah Thomas Broadside Ballads Project includes over 30 ballads performed by David and Ginger Hildebrand as mp3s on the site. 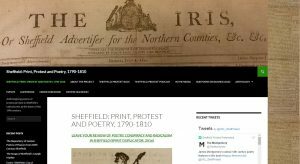 And 25 broadsides (and counting!) 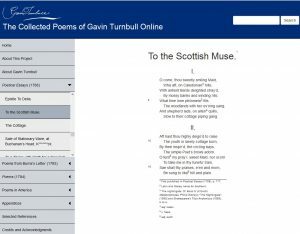 have been transcribed with TEI-encoded XML available for download. In addition to the short essays that accompany each broadside, longer essays by Keller, Dianne Dugaw, and Marcus McCorison give an overview of the content, detailing the Coverly printing network, the type and paper used to print the broadsides, and the culture of song in early America. All of the sources cited in these essays and in the individual broadside essays are in the Works Cited, which includes over 1,200 sources. Please join our Zotero group, which is open to the public and will allow a user to export these citations as needed. 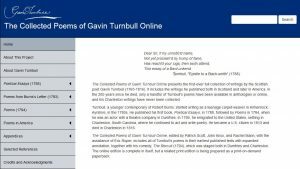 In the spirit of AAS’s rich tradition of deep cataloging, extensive subject headings are provided for each broadside, and these subject headings can all be searched. This index of topics covered in the ballads allows a user to group the ballads thematically in a way analogous to chapters in a book. 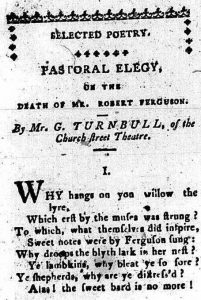 For example, by clicking on “Adultery” one can see that two broadsides include ballads on this subject: “Penny-Worth of Wit” and “The Country ’Squire.” Note too that the subject headings appear at the bottom of the page. By clicking on “children,” one can see the 10 total items that include this subject heading as well. Any combination of search results can be exported by the user in a number of machine-readable formats. Additional mechanisms are also in place to illuminate the relationality of the broadsides. For example, most individual essays make reference to other ballads that share a tune or perhaps a thematic link. In addition, the woodcuts that appear on multiple broadsides can be traced. Longitude was a hot topic in eighteenth-century Britain. What we might perceive now as a niche, and perhaps rather uninteresting, navigational problem, was then crucial to finding a means of accurately measuring longitude at sea as Britain’s trade and naval aspirations expanded. Supported by very large award monies from the government, the search for a solution became a subject of national discussion, ridicule, and social relevance appearing in every conceivable type of source from newspapers and novels to prints and paintings. My research looks at that plethora of paper materials, which had to be navigated on land by any person putting forward a potential solution, before it would ever be trialed at sea. 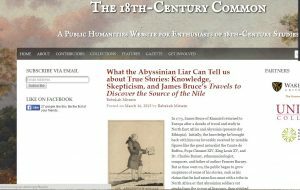 The questions, conversations, jokes, diagrams, and drawings in which Georgian men and women referenced longitude become visible in precisely the sorts of digital databases and collections that The 18th-Century Common seeks to showcase. 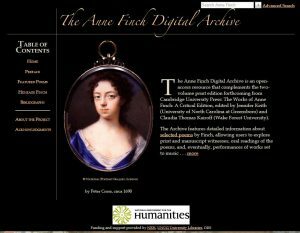 It is the ability to search these sets of materials that makes visible the kinds of throwaway references to longitude that would otherwise be almost impossible to locate, stimulating further research in physical collections. Digital resources, furthermore, allow us to begin to reconstruct the patterns of production as well as the use and reference in texts and images that physical collections can obscure. 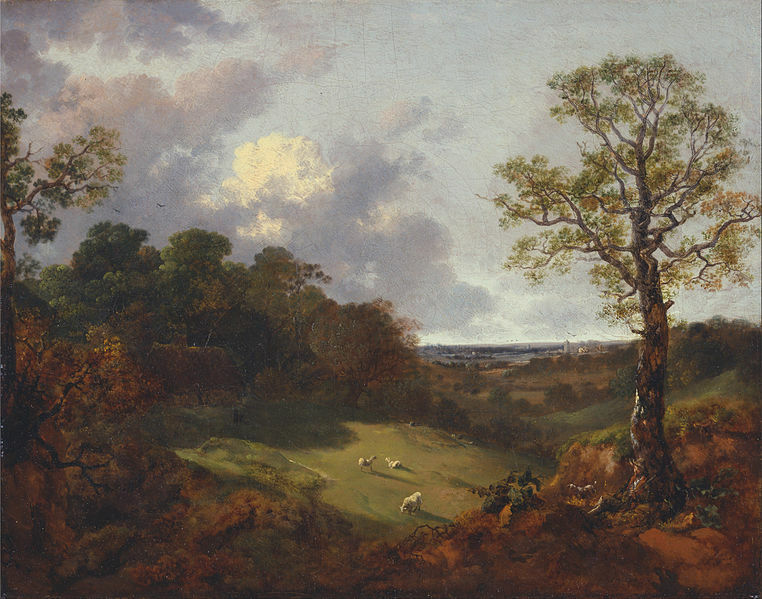 My recent project with the Paul Mellon Centre’s innovative online journal, British Art Studies, has begun to think about what possibilities this might offer. “Looking for the Longitude” brings together a series of images and commentaries to consider how people experienced the longitude debate in eighteenth-century London, using as a starting point an engraving from William Hogarth’s famous series, A Rake’s Progress. A pirate version of the image, done from the copyist’s memory of the original painting in Hogarth’s studio, offers the opportunity to examine what the copyist remembered and altered. Marshaling a selection of texts and images that circulated at the time serves to show how such materials would have affected what this copyist, and other viewers, saw in Hogarth’s engraving. It allows us to construct a period eye. This was also a particularly London story, however, tied to a group of metropolitan locations that shaped production and consumption of text and image. 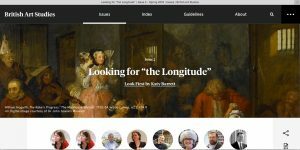 Each of my longitude images is therefore located on an interactive map and enhanced by commentary from a group of expert contributors, ranging across histories of art and science. They consider the significance of the urban setting, bringing into play a further circle of materials and texts. Over the course of 11 days in June 2016, these appeared as part of a daily Twitter tour that you could, and still can, follow around the British capital. 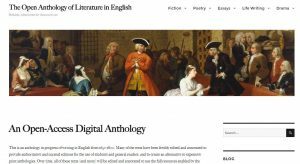 My hope is that this digital project serves to reconstruct a sense of the rapid production and discussion, the buzz and fervor, that surrounded the longitude problem in the eighteenth century; and that in combining digital collections with digital publishing it makes the case for what such platforms can achieve.